A collection of documents and color photographs from the 2nd IYPT has been preserved by Ron Peerlings, a Dutch team member in 1989. Ron Peerlings is now an Associate Professor in the Materials Technology Institute, Eindhoven University of Technology. R. P. Vincent told me about your effort. I’m sure I have photographs of the trip and tournament. I’m not so sure about documents etc. 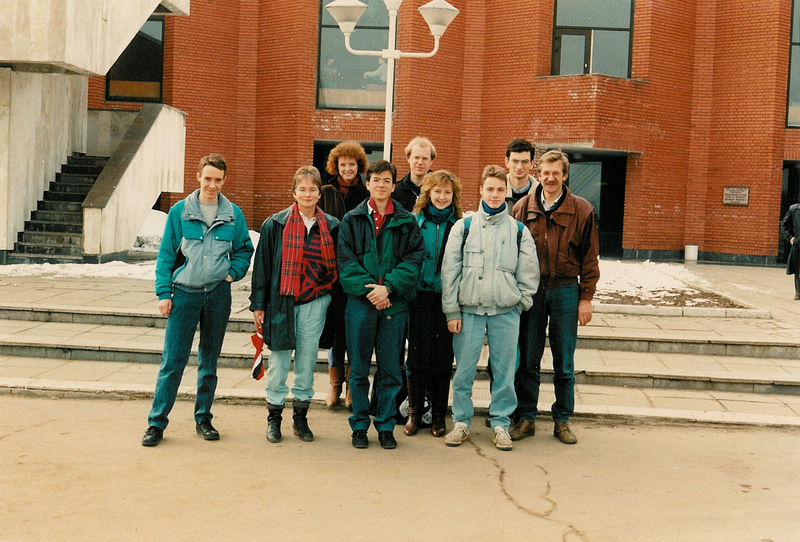 I have fond memories of the trip to Moscow — it was a fantastic experience for an 18 year old! 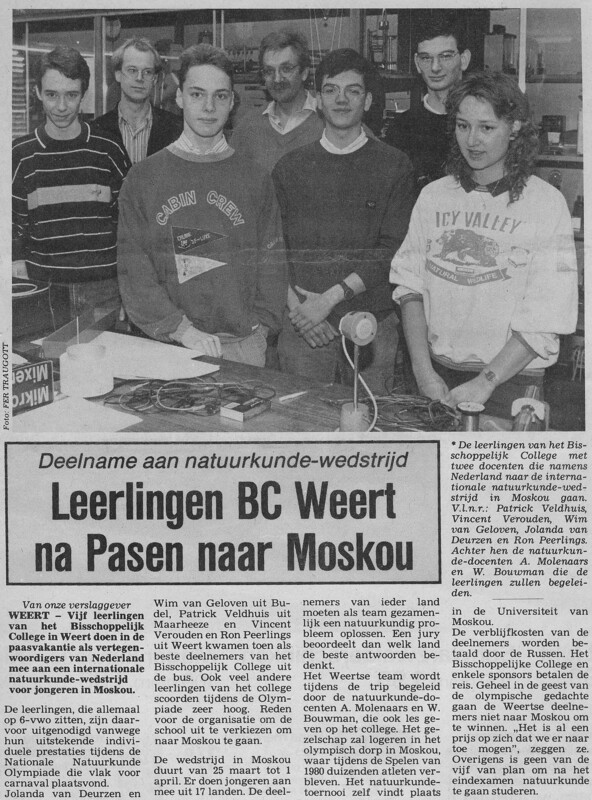 Included are the program, problems, some pictures and two articles published in a regional newspaper (“De Limburger”) before and after the tournament respectively. Should you have received any other photographs of the 1989 edition, I would be very interested — I couldn’t find any on the website? I. M. If new materials appear, I will signal to you immediately. We would be equally indebted if you know other participants who might have preserved extra materials from that time period. So far, I don’t have any other photos that were clearly made in 1989. 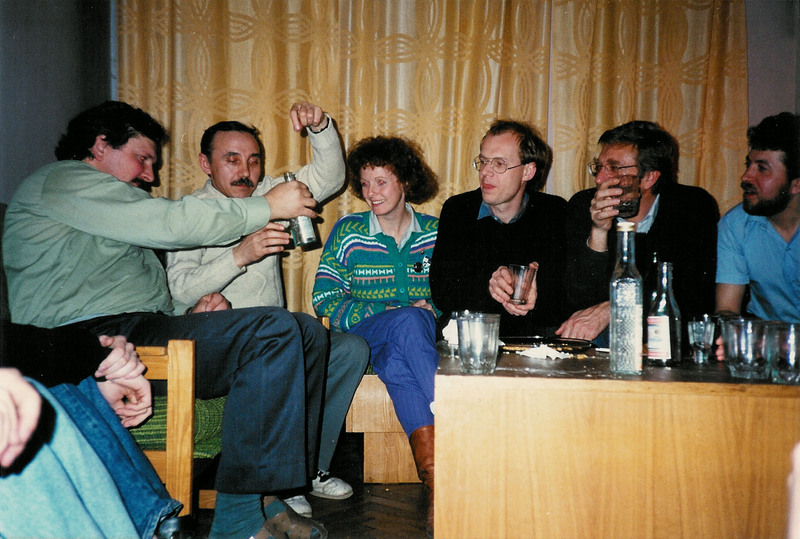 There is a collection of photographs from co-organizer Evgeny Yunosov (who is seen as a chairperson at photo07.jpg.) You can find all his photos here. He has a section named “1989″, but there is solid evidence that those photos were actually taken in 1990. The Bulgarian participants shared the scans of badges and diplomas, and a Belarusian participant shared one single photo where little is seen. R. P. I do not really recognise anyone in the photographs of Dr. Yusonov, which is consistent with your statement that they may be from another year. Can I please ask you for the detailed references to the articles in “De Limburger”? The reason is that the publishers might have their internal index and know about the IYPT-related articles covering the following years (e.g. 1990, 1991.) I tried on several occasions to directly contact publishers of such “irrelevant” newspapers, and a few times it helped to reveal extra sources. R. P. The two cuttings from “De Limburger” are more about our participation and trip and not so much about the tournament itself. There are no dates on them, but they must have been published in the weeks before (article01) and after (article02) the tournament. “De Limburger” is a regional newspaper and I would be very surprised if they would have written about the tournament on other occasions. 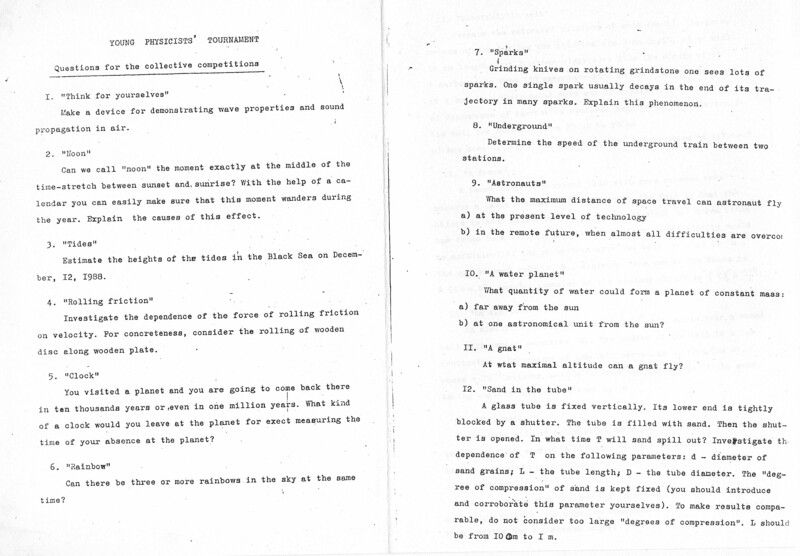 I. M. As for some materials in Russian language that you can find in the Archive, there are only one or two truly relevant papers. 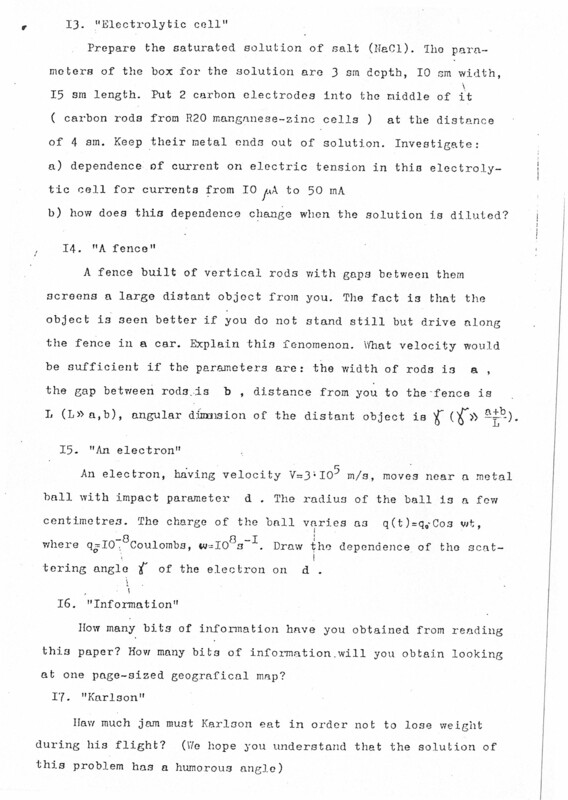 There is a single-page newsletter in the Soviet popular physics journal “Kvant”, and one more article giving the problems. Ironically, those problems were published in August 1988 and intended for the 2nd IYPT, but then were replaced (9 out of 17 problems.) An English copy that Hans Jordens has preserved, is matching the Kvant version and is incorrect. When we now have the authentic text, it will be possible to improve my previous “reconstruction” from Russian and Czech sources. Do you have any information when this replacement might have happened? R. P. I wasn’t aware of the replacement of problems. 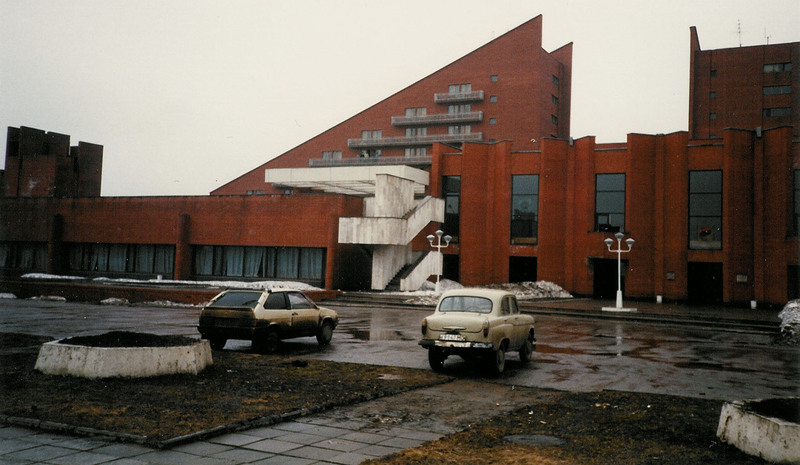 In fact, as far as I can remember we only received the problems upon arrival in Moscow. I distinctly remember working on them long hours during the first days of the tournament. [An update:] It seems that I was wrong when I said we received the problems only at the spot. 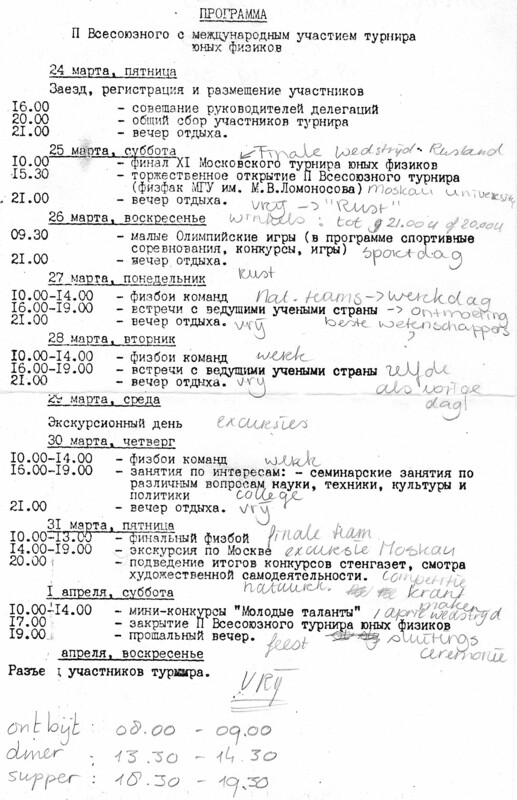 My notes mention that we did some preparation at home, before leaving for Moscow. However, we received the invitation only on March 12th (12 days before leaving), so there wasn’t much time to prepare. And I don’t think it was clear to us which role these problems would play in the tournament — information on the format of the tournament was scarce at the time. I. M. Thank you for this detail. 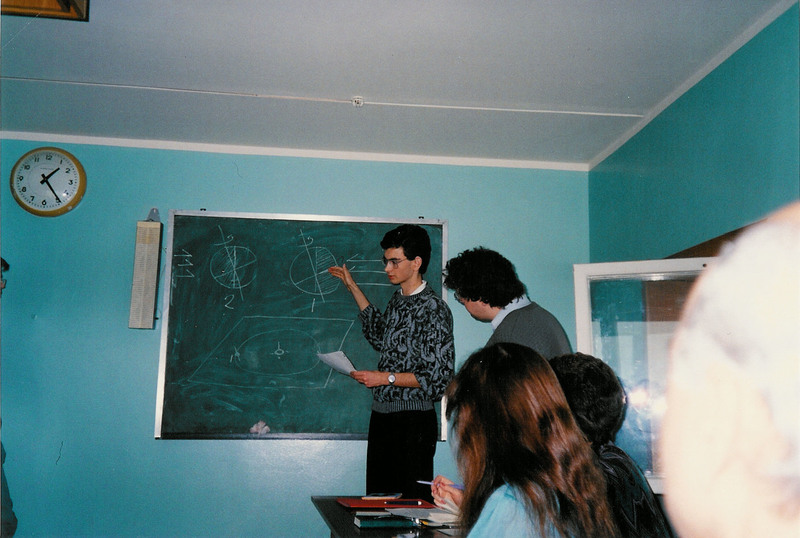 According to the Hungarian participants, the Dutch team received the problems “on the spot” also in 1990. 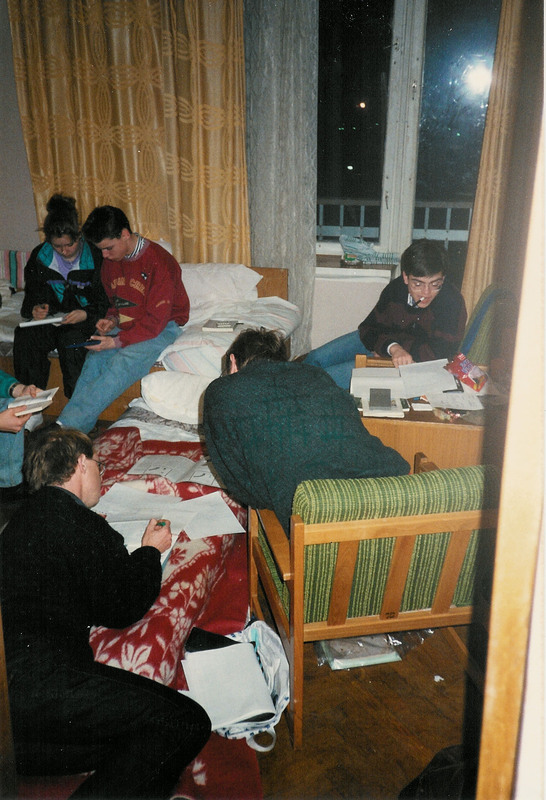 When compared to the today’s practice, it is a very remarkable historical curiosity (most teams now start the work on the problems well ahead of the IYPT.) 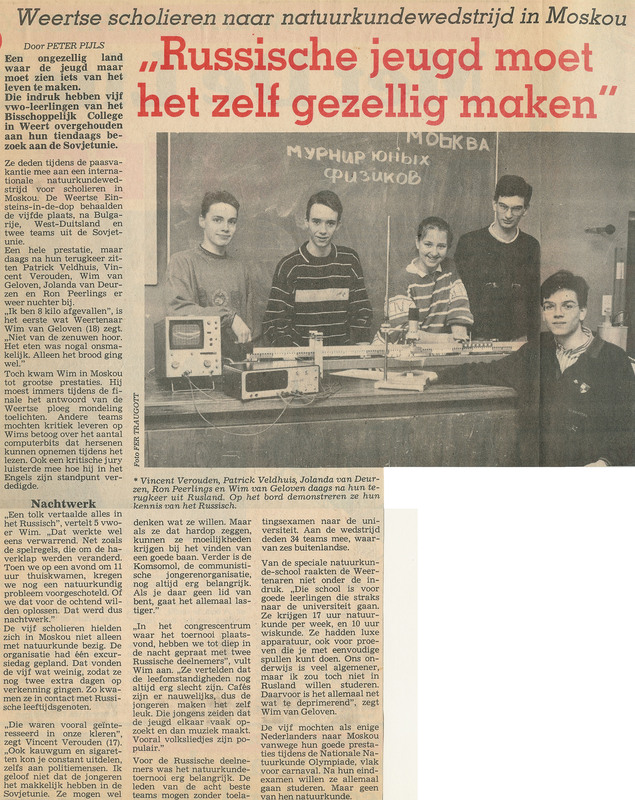 One more curious historical highlight with the Dutch teams was in 1992, when they brought a laptop with a transparent LCD panel and made full-scale multimedia presentations by putting the laptop onto the overhead projector. R. P. I wrote some notes next to the photographs. I will read them again over the next days and let you know if anything useful comes up. I. M. Is it true that eight teams took part in the finals on Friday? Did all of these eight teams make talks in a single room? R. P. According to my notes, there were two parallel final sessions, with four teams each. 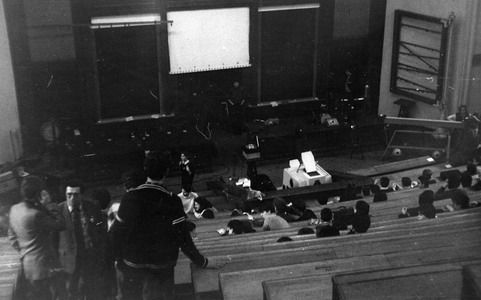 The scores obtained in them were used to construct one final ranking. The other teams on our session were Bulgaria, School 710 and Hungary. This does not seem to be in complete agreement with the factsheet on the archive webpage. However, I honestly can’t remember how I got hold of these scores, so your sources might well be more accurate. 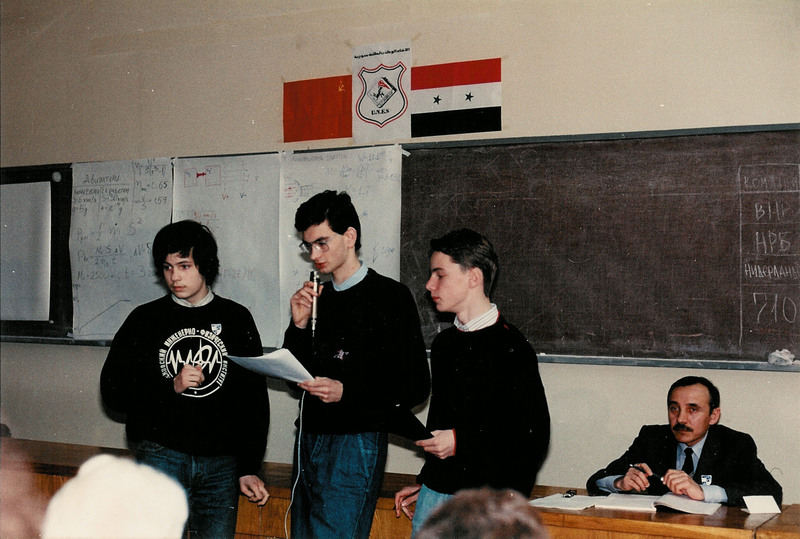 I. M. There is qualitative agreement with the other sources (Bulgaria, West Germany and School 710 on the top; Finals held with all non-Soviet and two Soviet teams; eight teams in total at the “International Rounds”.) I easily imagine that there were many last-minute changes in the regulations, and that the entire IYPT was in its test phase. Many thanks for keeping safe and sharing the ranking! Basically, we now have a direct record made by a first-hand participant at the actual stages of the IYPT. I believe such a record must be more reliable than anything else. Many thanks for keeping safe and sharing the ranking! Basically, we now have a direct record made by a first-hand participant at the actual stages of the IYPT. I believe such a record must be more reliable than anything else. Can we please ask you to kindly scan your handwritten ranking? This will be a solid “primary source” on the results of the 2nd IYPT. We would be very glad to have it in the collection as an “artifact”, and to rely on it in the future. R. P. I have attached a scan of my notes of the final ranking of the tournament. I. M. Can I please also check one more detail with you : was Hans Jordens attending the event, or he just contributed to arranging your trip? R. P. Hans Jordens did not join us to Moscow; in fact I think I have never met him. He invited our school to participate in the tournament because as a school we obtained the highest scores in the national physics olympiad. So the five (student) members of our team were from one school (Bisschoppelijk College Weert) and were the highest-ranked participants from that school. Two of our physics-teachers accompanied us and their spouses came along as well (at their own cost). 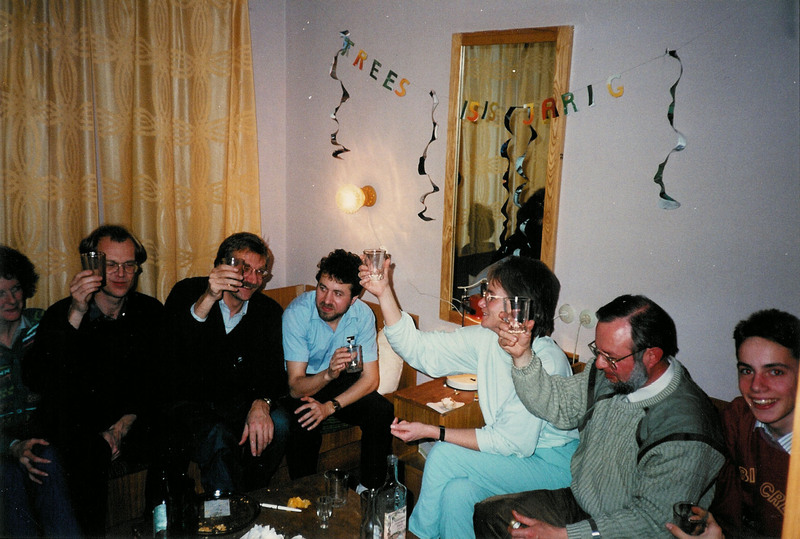 You can see all Dutch persons present in photo08.jpg, from left to right: Patrick Veldhuis, Trees Raassens (partner of Willem Bouwman), Gertie Starmans (partner of Ad Molenaars), Wim van Geloven, Ad Molenaars (teacher), Jolanda van Deurzen, Vincent Verouden, Ron Peerlings, Willem Bouwman (teacher). I. M. Many thanks for your efforts and this great input on the 2nd IYPT These are just incredible materials and recollections. 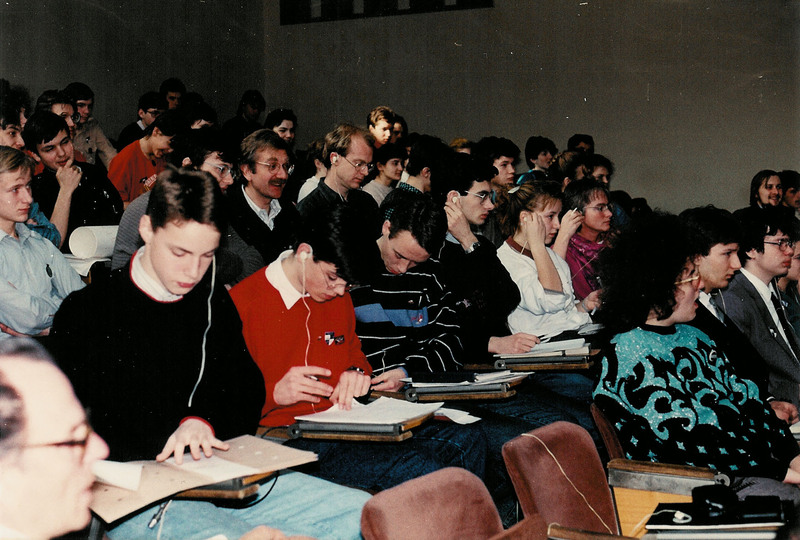 That IYPT 1989 was the first truly international and properly organized event, as in 1988 there were only two non-Soviet teams who came to Moscow (and it looks like the things were tested ad-hoc in 1988.) Quite surprisingly, the IYPT has evolved now into a very serious event (iypt.org.) Therefore, it is especially interesting and important for us to know the origins. R. P. Good to hear that my scans are useful to you. I forgot to mention that the text written on the program is a loose translation of it. Hope this is of some use! R. P. scanned and shared the documents between October 13 and October 30, 2011.